The walls of the treeehouse are 6 ft, 3 in tall. 2x4 studs were used to form the walls and are spaced 18 inches apart. A ring of 2x4's on the floor forms a bottom plate and a ring of two 2x4's are used to form the top cap of the wall. Since the base is 10 ft x 10 ft, the proportion between the walls and the base results in the Golden Ratio. Looking at the frame from a few feet back, this just feels right. After the bottom plate was laid, the corners were secured. Each corner consists of three 2x4's clustered together. The corner by what will be the main entrance is a 4x4 deck timber. Once all four corners were defined, the top cap was installed. With the top and bottom of each wall outlined, the studs were filled in. The rafters are pitched at a 30 degree angle. Each rafter is a carbon copy of an original that took more time than I care to admit to making... let's just say the other 15 rafters were constructed in an equal amount of time. Each rafter is 6 ft 8.5 in long. The top and bottom of each rafter is cut at a 30 degree angle forming a really long parallelogram. When a rafter is positioned at 30 degree angle relative to the ground, the cuts are perpendicular to the ground. At 1 ft from the bottom of each rafter I cut a 1 in deep bird's mouth cut out. The bird's mouth creates a horizontal shelf within the rafter that allows the rafter to sit on top of the walls. The rafters connect to a ridge that runs along the top of the roof line. Just under the intersection of each rafter-pair there is a cross member. This cross member makes the assembly look like the letter "A". 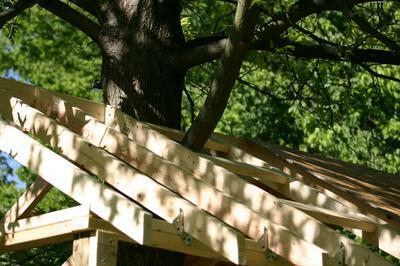 Since the tree goes through the middle of the roof, I had to construct the rafter sections in two parts; one for each side of the tree. 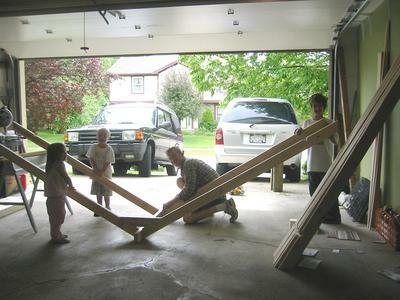 The first rafter half was constructed in the garage. Working on the ground -with a little help- went quickly and efficiently. 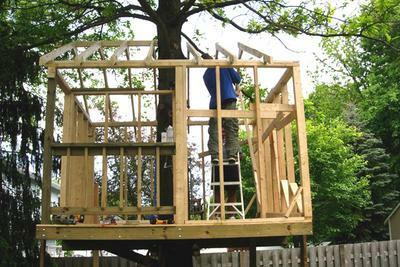 The difficulty came when the pre-assembled rafter section was hoisted up on top of the walls. 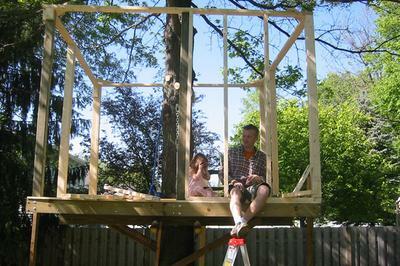 The assembly consists of 8 nearly 7 ft long 2x4's and a 5 ft ridge board. My guess is that assembly weighs about 70 lbs. Not terribly heavy, but terribly cumbersome 16 ft off the ground. It took two grown adults and an impromptu pulley system to hoist the rafter section up. 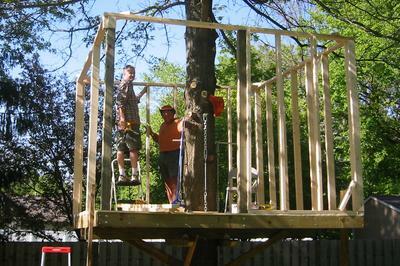 The second rafter section was built in the treehouse. It was painful to work with the angles up in the tree, but the pain was in smaller doses than hoisting it all up all at once. 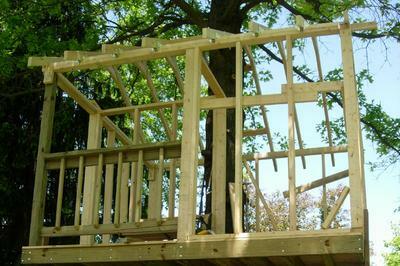 With both rafter sections installed, 2x4 spacers were used to join the two rafter sections together. Once the roof was framed, the entire structure became much more ridged, moving as one unit. One of the biggest challenges during this phase of construction was making sure everything was 'square'. Normally, a level would be used to ensure that all of the connections being made are happening at a 90 degree angle. In the treehouse, I get a fair amount of 'play' as I move from one side to another so I can't rely on a level. To keep the structure square i would measure three times and use a T-square to ensure that my boards were coming together at right angles. Not ideal, but I figure that by using two parameters I can be reasonably certain the structure is reasonably square. Brent, this treehouse is amazing. Would you consider renting it out for a weekend? I'd like to take my wife "camping" and a stay at your treehouse sounds fun. Maybe this could turn into a bed and breakfast gig for you? Can't wait to see the next installment of this story. Brent, your kids are so lucky to have you as a dad -- this is an awesome gift. You are looking pretty good yourself...Grandpa's in treehouses..what will we see next. Take care my friend, you are a fortunate man. Substantially, the post is actually the greatest on that worthw hile topic. I harmonise with your conclusions and will certainly thirstily look forward to your coming updates. Simply just saying thanks can not just be adequate, for the extraordinary lucidity in your writing. I can without delay grab your rss feed to stay abreast of any kind of updates. Fabulous work and much success in your business enterprize! the higher education students operating out of Wales, in 1983.
effort and effort that med school and post graduate training will demand. 50 years after the first exposure to asbestos. Pleural mesothelioma, that's the most common variety and is affecting the area around the lungs, could potentially cause shortness of breath, upper body pains, along with a persistent coughing, which may cause coughing up body.